These rosy-pink flowers make a high impact display in your garden when displayed against their dark purple, glossy foliage. 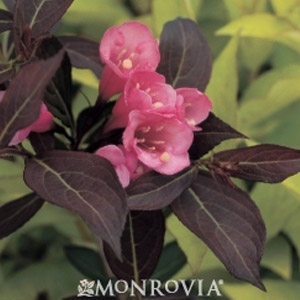 This variety produces copious amounts of flowers in spring, and will re-bloom throughout the summer. Average size: 4 to 5 ft. tall and wide. These trumpet-like flowers are adored by hummingbirds and attract butterflies. Deer resistant. Fast growing and trouble free. Adds color all season long in your garden.